Sunday September 9th 1923 William and Mary came for me and after we had dinner we rode most of the afternoon. Out to Camp Dodge and Ft Des Moines. A fine afternoon. I had never visited these places. Spent the night with them. Monday September 10th 1923 Mary and I down town before time for lunch. William ate with us and Mary stayed with me till I left. Reached home at 7.45. Rob met me. Later they went to West Liberty to put Robert Jellison on his train for home. Ott & Fannie came up to see me. I put my things away. Left a month today. Tuesday September 11th 1923 I was down to Fannies in AM. It rained some. Hattie to town after dinner. I wrote in this book in PM. I read and talked with Hattie in evening. card from Lizzie. 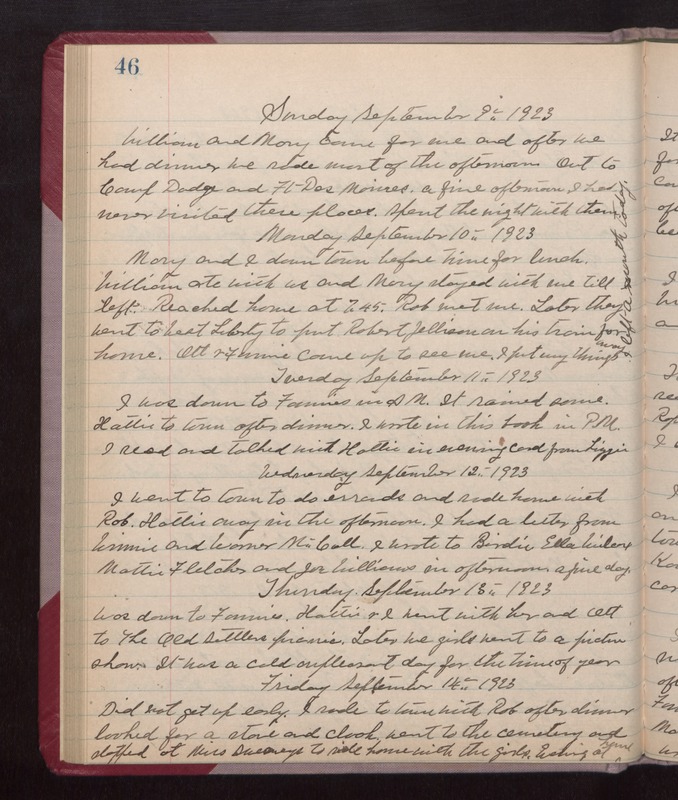 Wednesday September 12th 1923 I went to town to do errands and ride home with Rob. Hattie away in the afternoon. I had a letter from Winnie and Warner McCall. I wrote to Birdie, Ella Wilcox, Mattie Fletcher and Joe Williams in afternoon. A fine day. Thursday September 13th 1923 Was down to Fannies. Hattie & I went with her and Ott to The Old Settlers picnic. Later we girls went to a picture show. It was a cold unpleasant day for the time of year. Friday September 14th 1923 Did not get up early. I rode to town with Rob after dinner looked for a stove and clock. Went to the Cemetery and stopped at Miss [Sweneys?] to ride home with the girls. Evening at home.